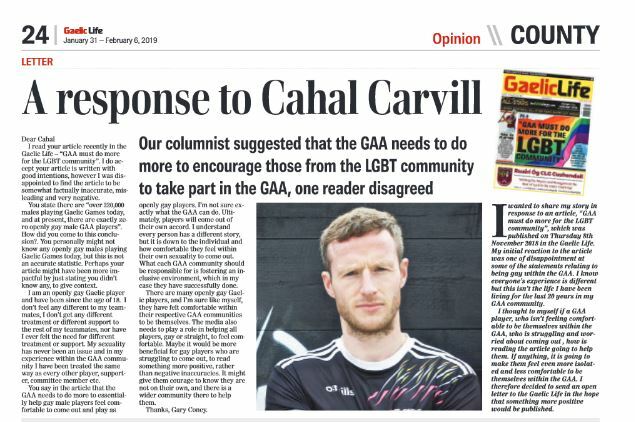 Last year the Gaelic Life ran a piece suggesting that more should be done to support the LGBT community, however one player told us that he has enjoyed a positive experience of being Gay within the GAA. It was printed in last week’s paper but we wanted to put it out online for free so more people could read an important story for the GAA. I understand there still exists this stigma/stereotype that being openly gay and playing sports don’t go together. And maybe this is partly media driven. And I agree that the numbers don’t stack up in terms of there probably should be more openly gay Gaelic players. But it just not as black and white as saying ‘gay players aren’t comfortable to be themselves within the GAA’. There are players I’m sure who simply don’t want to come out, not because they don’t feel comfortable, but rather they like their privacy, and you have to respect this. But for those players that are struggling I just want to say there are positive stories. I’ve been openly gay from 1999 and things have moved on a lot since then. I know of other openly gay Gaelic players, and even one of the country’s top referees is openly gay. I know the GAA isn’t perfect and as an organisation we can always do more. It’s the responsibility of everyone in the GAA, from your own teammates, your own club, your own community, right through to your own county board and Croke Park, to ensure all our members can feel comfortable to be themselves. The Ulster Council participating in Gay pride and providing rainbow gloves and banners is a nice touch, and shows the world the GAA supports the LGBT community. Will this help players feel more comfortable to be who they are. Maybe, I don’t know. For me hearing a real experience, a positive experience, like mine, might have a better impact. For me I have always felt comfortable to be who I am in the GAA. I am proud of who I am, I am proud to play Gaelic for my club Clonoe O’Rahilly’s, and I am proud of my GAA community. I wanted to share my story so that it might give hope and encouragement to those players who are struggling to be themselves within the GAA. Even if it helps one player then sharing my story will have been worthwhile. I guess I knew I was gay from the age of 13 without actually knowing it. It might sound strange to say that, but I knew I was more drawn to boys, I just didn’t know what it meant. By the age of 16 I knew I was gay but I didn’t know how to accept it. I thought maybe it was a phase that would go away, or even hope to go away. I was doing the normal lad stuff, going out to disco’s with your mates and going with girls. But I always knew it didn’t feel right and I felt I was doing it to be like everyone else. It was a cover up. By the age of 18 I accepted I was gay and I didn’t want to pretend to be someone else. The first person I told I was gay was my brother. I was 18 and I knew he would be fine about it, but I was still petrified. I think I cried when I told him, to finally say them three words ‘I am gay’ to another person was a massive release. He told me he loved me and it didn’t matter if I was gay or straight, I was still Gary, his brother that he grew up with. His positive reaction gave me a lot of confidence, and after that it was much easier to tell family and friends. Sometimes when lads come out they change, their personalities change, they stop playing Gaelic, they move away, some lads move away first of all then come out. Maybe this is what they want to do or maybe they feel they need to do this. Maybe they are worried that they will be treated differently or their teammates will look at them differently. But I never wanted do to this or felt the need to. I was still the same person when I came out, the GAA mad footballer who loves his football club and community. Sport is a massive part of my life and I guess I always felt comfortable to be who I was in my surroundings and my GAA community. I didn’t make a big song or dance about being gay and I wasn’t going around telling every person I met I was gay. Anyone that I told I was gay, I said to them, tell who you want but don’t make a big deal of it, because for me it wasn’t a big deal, I was still the same person. I’d say by the age of 20 all my team mates knew I was gay. I’m now 37 and have been playing senior club football from the age of 18. I have no intention of retiring, as long as I am fit and able to contribute to the team I will continue to play. Playing for 20 years at senior level, I have played with many players, each year new players are coming through and I have played under many different managers and coaches. I have never been treated any differently by my teammates or managers. Being openly gay has never had an adverse affect on morale in the changing room, and as a team over the years we have been quite successful winning leagues and championships. I have the usual banter with my teammates, and they are comfortable enough to have banter back with me. They always show an interest in my life and I can talk freely about whom I am dating or was I at a gay club at the weekend. Some of my teammates have been to gay clubs with me. Like the rest of my teammates it’s normal for me to take a partner to matches, to dinner dances, club functions, weddings etc. I live a ‘normal’ life within my GAA community. I’m not going to lie and say I have never received negative feedback. There were two incidents when my sexuality was referenced on the field by opposition players. I remember the first time it happened, I was called gay boy. For me it wasn’t a big deal, and after the game the player and his manager sought me out to apologise. This doesn’t excuse what was said, there is no place for these sorts of comments in the GAA community, or any community and I would expect the GAA to come down hard on anyone found guilty of them, especially in this day and age. Bar the two isolated incidents, which were 10 years ago, I have not heard another word or been discriminated against because of who I am, and I have never witnessed any comments of this nature as a supporter while attending matches around the country. The thing is, in today’s society the majority of people have an openly gay person in their lives, be it a friend, a sibling, a relative, a work colleague or even a teammate, so I’d be surprised if these comments are common place now.